Today, you will embark on a day trip to Badaling from Beijing. At 09:00 am, our guide and driver will pick you up from your hotel and they will confirm the exact departure time one day in advance. Then a 1.5-hour private vehicle ride will take you to Badaling Great Wall. Upon arrival, you will be warmly received by the working staff of the scenic area. 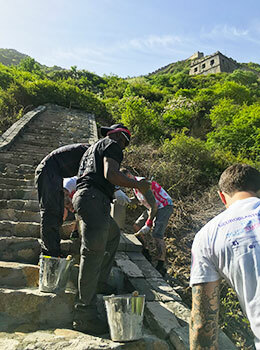 They will brief you on the detailed work, the do's and don'ts of the Great Wall repair volunteer program, and meanwhile distribute tools used for repairing, such as buckets, brushes, gloves, shovels, etc. Accompanied by the restoration experts and our guide, you can undertake a lot of interesting tasks, including moving bricks, building a wall, and paving the ground. The whole volunteer work may last about 1 - 1.5 hours. When concluding all the work, you will be free to enjoy a delightful sightseeing and hiking on the Great Wall. At the end of this day trip Beijing to Badaling Great Wall, our guide and driver will transfer you back to your hotel in downtown Beijing. Different from any other Great Wall trips, this Volunteer Repair Program tour would bring you a more interesting and memorable Great Wall experience. 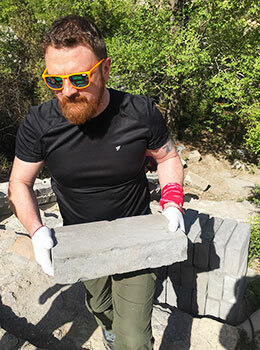 You can not only learn a lot about the wall's long history and culture, but also get real insights into how it is repaired and restored by enjoyable hands-on activities, such as walls building and trail paving. All these practices would be performed on your own under the guidance of our experts and tour guide. 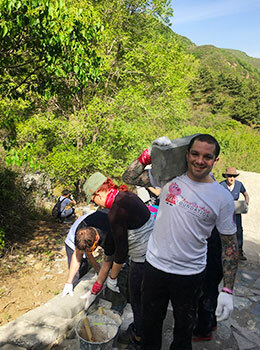 Full of educational significance, the Great Wall Volunteer Repair Program is suitable for both family travelers with kids and overseas student study groups. As a magnificent defensive system stretching over 21, 000 km (13,050 mi), the Great Wall is more than an icon of China, but an enduringly man-made wonder in the world. Today, you will launch a fantastic free trekking journey on the Great Wall. Badaling, the most typical and best-preserved section of the wall, will reward you with awe-inspiring landscapes and sceneries by snaking through the precipitous mountain ridges as far as one cannot see. You could take a leisurely walk around to take some great photos, or accomplish the entire hiking journey on Badaling Great Wall. 1. Please wear casual clothes and comfortable shoes as you are going to exert yourself a bit to do the repair work and take some hiking after that. 2. It's hardly to find a shade on the Great Wall, so you'd better prepare hats, sunglasses and sunscreen in case of sunburn. 3. The lunch is on your own, but our guide will be glad to make recommendations on nearby restaurants catering to your preference. Alternatively, you could have big breakfast in the morning and pack some easy-carry snacks for a meal.